YaCy (pronounced "ya see") is a free distributed search engine, built on principles of peer-to-peer (P2P) networks. Its core is a computer program written in Java distributed on several hundred computers, as of September 2006[update], so-called YaCy-peers. Each YaCy-peer independently crawls through the Internet, analyzes and indexes found web pages, and stores indexing results in a common database (so called index) which is shared with other YaCy-peers using principles of P2P networks. It is a free search engine that everyone can use to build a search portal for their intranet and to help search the public internet clearly. Compared to semi-distributed search engines, the YaCy-network has a decentralised architecture. All YaCy-peers are equal and no central server exists. It can be run either in a crawling mode or as a local proxy server, indexing web pages visited by the person running YaCy on his or her computer. (Several mechanisms are provided to protect the user's privacy). Access to the search functions is made by a locally running web server which provides a search box to enter search terms, and returns search results in a similar format to other popular search engines. YaCy is available on Windows, Mac and Linux. YaCy was created in 2003 by Michael Christen. A search robot that traverses from web page to web page and analyzes their content. Creates a reverse word index (RWI) i.e. each word from the RWI has its list of relevant URLs and ranking information. Words are saved in form of word hashes. Made as a web interface provided by a local HTTP servlet with servlet engine. Used to store the reverse word index database utilizing a distributed hash table. YaCy is a complete search appliance with user interface, index, administration and monitoring. YaCy harvests web pages with a web crawler. Documents are then parsed, indexed and the search index is stored locally. If your peer is part a peer network, then your local search index is also merged into the shared index for that network. A search is started then the local index contributes together with a global search index from peers in the YaCy search network. 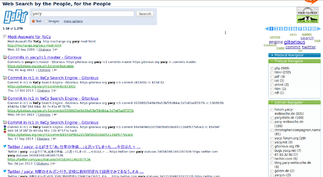 ^ "YaCy takes on Google with open source search engine". The Register. 2011-11-29. Retrieved 2012-04-16. ^ "YaCy: It's About Freedom, Not Beating Google". PC World. 2011-12-03. Retrieved 2012-04-16. ^ "Ich entwickle eine P2P-basierende Suchmaschine. Wer macht mit?". Heise Online (in German). 2003-12-15. Retrieved 2018-05-09. ^ "YaCy Technology Architecture". YaCy.net. Retrieved 2012-02-14. ^ "forum.yacy.de". Retrieved 6 June 2017. Wikimedia Commons has media related to YaCy. This page was last edited on 1 February 2019, at 22:29 (UTC).